Tamara trembled, hiding beneath her desk and holding her knees to her chest. She could hear the heavy breathing of an animal on the other side of her cubicle wall. She choked back a sob. The animal approached the corner of her cubicle. She pressed herself to the floor. The carpeted surface seemed so inviting. It caught at her, pulling at her, and then she was falling into the void. Spinning endlessly, Tamara struggled to catch sight of where she had fallen from and saw nothing. She was in the void and, with nothing left to hold on to, she finally gave in and became the void. 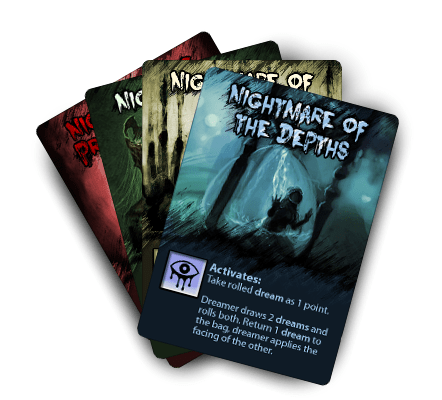 The original concept for Darkly Dreaming let players purchase cards to enhance their decks. The characters of Darkly Dreaming are insomniacs experiencing vivid waking nightmares. The horrors of their darkest dreams manifest in the world to hunt them down. To sleep, they must find peace before their nightmares take over and the dreamers become the nightmares that they fear most. With Darkly Dreaming, I wanted players to feel like they were drowning in nightmares, that it was inevitable they would eventually be overcome. Once a player “fell to the darkness” and became a nightmare, they could attack other players to stop those players gaining more points. I also wanted a press-your-luck mechanic, where players could try to “stay awake” and keep their turn going as long as possible, but the longer they did, the more random and hazardous their dreams would become. 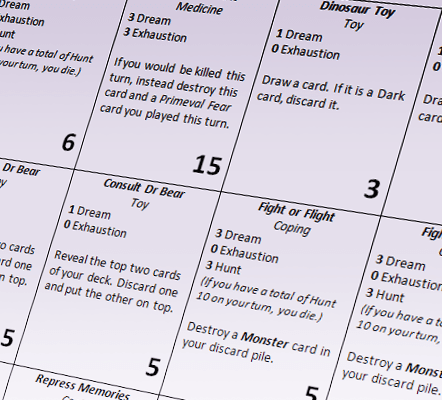 The first draft of Darkly Dreaming was a press-your-luck deckbuilding game. Players drew cards from their decks and played them. Cards gave “dream” (points to buy better cards), and “exhaustion” that ended their turn. Players could keep drawing cards until they hit 5 exhaustion, but at the end of their turn, they added Shadows, Monsters and Terrors based on how many matching “dark” cards they drew. When a player drew 2 Terrors of the same type, they became a Nightmare and got to spend the rest of the game attacking other players. Perhaps as a digital game, that would work. In practice, however, players spent more time shuffling their decks than playing the game. Players were drowning in cards, but not in the way I wanted! It didn’t matter how many ways I tweaked the system, it still resulted in too much shuffling and not enough player interaction. Cards to Dice: Kept the game random, reduced the “administrative” details of a turn (eg shuffling decks). Deckbuilding to Resource management: Removing “good” resources sped up the game, and focused it on the “joy” of getting overwhelmed by nightmares. A bunch of playtesting dice sit in the dream bag. I hope to use translucent dice with white paint inset for the final product. Three core mechanics that work well together. Players begin as “dreamers”. On a dreamer’s turn, they draw 3 dream dice from a bag, put 2 back and roll the last one. Dreams of the Depths: You are falling, drowning, pulled into the depths by something unknowable. These dreams force you to draw additional dice until you are dragged helpless into the dark. Dreams of Envy: Hate, jealousy and the sound of laughter behind your back. These dreams let the next player choose one of your dice; and you must reroll that dice. Chances of betrayal are high. Dreams of Cages: You try to run, but you cannot move; you stare through your eyes but somebody else controls your body. These dreams force you to end your turn earlier. Dreams of Primeval Fear: Eyes watch from the dark, claws close around your throat. These dreams increase your “hunted” score, possibly removing you from the game. 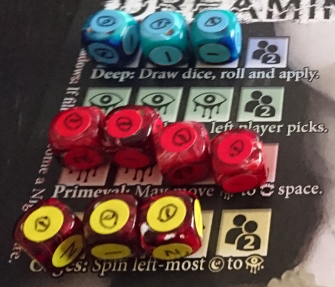 After rolling the dream dice, the dreamer applies its facing and places it on their card in the right spot. If they roll an eye symbol (“shadows”), it triggers the dream’s special (but horrifying) effects. Fill all of the spaces anywhere on the card and you suffer for it. Four shadows and you become a nightmare. Four “hunted” and you die. Three “exhaustion” and you end your turn and miss your next turn. Fifteen points and the game is over. After applying the dream, you can go to sleep, or stay awake. If you sleep, you end your turn and return 1 exhaustion to the bag. If you stay awake though, you increase the number of dice you draw, and take another turn. The longer you stay awake, the less control you have and the more random your dreams will become. If you want to give it a test, I have created a playtest document that allows you to simulate drawing coloured dice from a bag (and so play with just 9 regular dice). You can find that document here. If you want to create the game yourself, dice and all, you can click here instead (be warned, this game has 80 dice in it, so it takes a dedicated sticker-maker to do this). Nightmare balance: To make sure that each of the Nightmare effects is equally as good as the other. There’s no point in one Nightmare dominating every game. Balancing speed and fun: How many dice you can roll each turn. Players can currently roll 3, 4, 5, 6, 7, 8, then 9 dice on a turn. However, I am testing whether 3, 5, 7, then 9 will make the game quicker, while still allowing players to go all out and try to claw back victory once the game has ended. Colourblind Accessibility: Because colour is such an essential aspect of the game (making the choice of which dream dice to return to the bag a significant one), I don’t want it to be difficult to figure out what colour each dice is. In particular, I foresee issues between the red and green dice, and between the green and blue dice. The easier it is to tell which dice is which, the quicker the game will go. 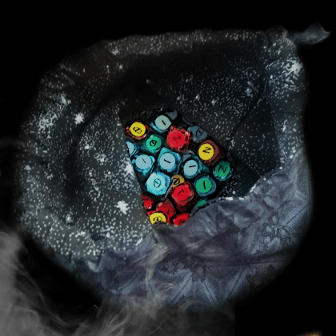 Darkest Dreams: For those who want to take big risks, the dream bag has “big” dream dice among the little ones. One of each colour, 16mm in size (as opposed to 12mm), each with its own horrific effect. You can’t put them back into the bag, and if you take two at once, you are out of the game. 16mm needs to feel distinct from 12mm so that players can distinguish them easily. That is something only playtesting can tell! All placeholder art at the moment. Playtest only. In Tempest, we commissioned artists very early in the process, Darkly Dreaming doesn’t yet have a firm artistic concept in place, so we’re holding off for now and using placeholder art for our playtests. But I would be interested to hear your take on the theme. What do you think? Does the world need another humorous horror game? Or is there a place for a light game of dark terrors? Does a realistic horror theme suit, or would a twisted, crayon-illustrated horror story work better? I’d love to hear your feedback on this, especially as we are so early in artistic development. Write to me at shannon@foxtalegames.com if you have feedback.